Dad2Amara is mortified to even admit to it. I think he's miffed it's even a topic on this blog. Me? The guilt kind of washed away when I knew it would keep the peace in Amara's House. But I must admit: we are living a lie. Mr. Beta is not who Amara thinks he is. 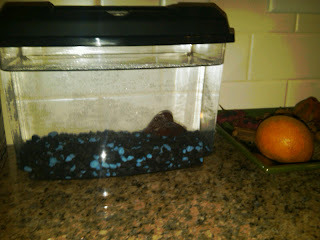 Here's our beta fish, who swims so unassumingly on my kitchen countertop. Amara feeds him twice a day his three pieces of fish cuisine. Dad2Amara cleans his tank once a week. Yet I guess it was his time. And he was called to fish heaven this weekend. But here's the thing: Mr. Beta isn't the first fish Amara has lost. Amara won Rainbow the Goldfish, at a church fair. And you know how those fishies go - Rainbow lasted 24 hours in Amara's House. So she was quickly replaced with Mr. Beta. So when I spotted Mr. Beta motionless, in a seeming a nose dive into the blue rocks below, I knew we would be flushing another pet into the deep wide open. I ushered Amara into the car and took her to a Girl Scout outing. And Dad2Amara bought a replacement beta. He's half the size of our first fish. But Amara hasn't caught on. And as long as Amara doesn't check this blog, our secret is safe. We started with Cosmo and Wanda and we had to keep replacing them until my son caught on. However, by that point, it did not matter because he was tired of fish and found another interest. Boy, am I glad those days are over. Oh, Mom2Amara, who's playing who? Amara strikes me as a very smart girl. I hate to burst your bubble, but in her innocent version of living the lie, she probably knows what you're up to. And you know what? She LOVES you for it. She may not realize it yet, but she does. I strung my parents out on the whole Santa Claus notion until...oh, college. Not that I hadn't figured it out early on (why does Santa have the same handwriting as mom? ), but my parents really loved doing the whole Santa thing, and I couldn't bear to ruin it for them. Of course, there was some tangible benefit for me, too. But it was a lie I let them live, and they let me live. In the end, no harm done, and lots of nice memories. That is TOO funny. We have a reef tank and if one of the Percula Clowns perishes, we'll be out $30, AND an established mate for the other one. I tried that once but I got too lazy and didn't go replace the fish... so Pufferfish got to go with me to the pet store choose a new one. But that one died too. And then the tank sprung a leak and all the water leaked out... but the first fish survived! And now he is in a tiny little tank, sadly missing his old big house and his friend! :( Fish are so complicated! I would definitely do this too. As long as she's happy! And I say good for you for having a fish. My husband and I would fight over who should clean the tank - so no fish for us until one of us grows up.